A couple of weeks ago we managed to get in our first game of X-Wing and it was great. In an effort to get everyone in on the game we set up a 3v3 110pt game, one of us brought Han Solo and he would proceed to dominate the show! As this was our first game we decided to avoid over-complicating matters with the addition of obstacles and so the battlefield(?) was just open space. Both teams were quite expansive with their setups, the Rebels placed Han in the centre and the two Red Squadron Pilots took up position in the opposite corners of their deployment zone. For the Imperials the plan was simple, trap the Falcon in swarms firing arc and bring it down as quickly as possible. To this end the Imperial squadron set up with all six Academy Pilots lined up across the centre of the board with Whisper holding the left flank. With the lowest pilot skill the Academy Pilots got to move first, there would be no finesse to the early stages of this engagement, the Imperial forces steaming straight up the board like a freight train. The two Red Squadron pilots closed in on the flanks of the Academy Pilots while while Whisper silently drifted in behind the grey wall of TIE Fighters, and the Falcon mirrored the movement of the Phantom. The only action of note at this early stage was Whisper cloaking for the bonus 2 move at the beginning of the next turn, unfortunately I misjudged the distance and this failed to benefit us whatsoever. Han and a couple of the academy pilots traded blows but neither managed to land a hit. The next turn things began to get interesting. With the opportunity to move first the academy pilots swarmed Han Solo and AP5 managed to position itself perfectly to cause a collision with Han, preventing him from taking an action this turn. One of the Red Squadron pilots (25) managed to get a target lock on AP42 but it came to nothing, the other RS pilot (3) brought down AP6 with the help of Han. Whisper landed a hit on Han and proceeded to re-cloak. block off his escape but left just enough room for Han to move into the space left in the wreckage of AP6. Han did collide with Whisper but he was now out of the arc of most of the academy pilots. Please excuse Han being off his stand at this point, we couldn't fit all the models in! RS3 brought down AP2 and the Imperial formation quickly fell into disarray. RS25 continued to target lock AP42 to little effect and AP41 managed to land some hits on him while AP42 and Whisper cleared out the shields on RS3. AP1 landed some more hits on Han but Chewie brought the shields back up, AP5 brought his ship around to re-enter the fight. At this point Han proceeded to run circles around the remaining Imperial forces as 3 Academy Pilots clustered together trying to get him back in their sights. RS25 continued to chase AP42 across the board and so the Imperials hatched a plan to trap him in the cross-hairs of as many ships as possible. With one shield back up RS3 tried to escape Whisper who had de-cloaked again to get the best firing position on the Rebel ship. AP41 decided to take on Han 1v1 at this point as he really didn't have anything better to do. With the Imperials springing their trap RS25 tried to escape but it was too late. Caught in the crossfire of APs 1, 41 and 42 RS25 was blasted into oblivion. RS3 tried to escape in all of the commotion but Whisper finished him off. AP5 was left to face Han on his own... it didn't end well. With the X-Wings down the remaining Imperial ships tried to catch Han, but his superior maneuverability and 360 firing arc allowed him to pick off each ship one by one with Whisper the final Imperial to fall. Wow Han really is as good as everyone says. The boosted movement from the engine upgrades combined with the special abilities of Han, Chewie and Luke make him a really tough nut to crack that also packs a powerful punch. I feel our idea to swarm him and take him down first was sound, the two X-Wings, while resilient to a degree, did not pose as much of a threat as Han did and they were easy enough to bring down when we brought our firepower to bear. 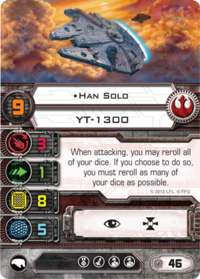 With only one defence die if you were able to score enough hits from the Academy Pilots then you could do a lot of damage to Han but the issue we faced was trying to get him in our sights. Early on we had a chance but one mistake cost us as it allowed Han to escape our net. On the Imperial side I was really impressed with Whisper. The Phantoms boost movement after de-cloaking can be really useful and the Advanced Cloaking System means that most ships will not be able to hit the phantom as easily if your pilot skill is high enough. 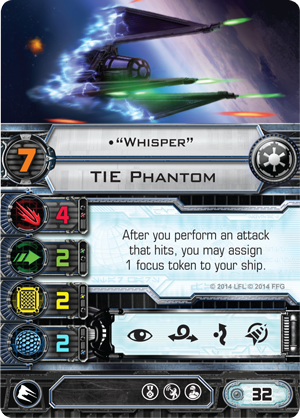 I felt that our TIE Phantom build was strong but it is expensive coming in at around 38 points. To make the most of this ship you need to have high pilot skill and the Advanced Cloaking System gives it the added survivability but there may be a better use for the two points we invested in tactician once we have some additional ships at our disposal. All in all it was a great game and I was glad to get the first game under my belt, I'm sure with more experience I will be able to bring down Han, we just might need a bit of luck (and some bigger guns) to achieve it!